IRS Tax Lawyer Naperville: Fraud or Negligence? 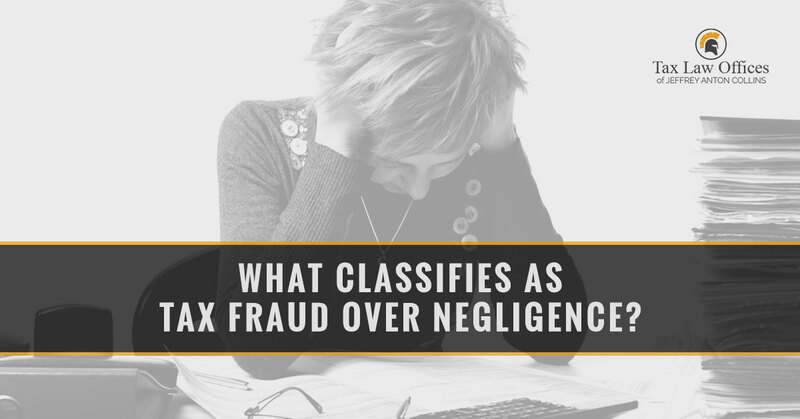 What Classifies as Tax Fraud over Negligence? Believe it or not, the IRS estimates that only about .0022 percent of taxpayers are convicted of tax crime each year. However, they also claim that around 17 percent of all taxpayers make serious mistakes and do not comply with the tax code. On top that, individual taxpayers are the ones who commit 75 percent of all tax fraud—not corporations. So which violations are people making, and why isn’t this sort of behavior considered to be fraud? We at Tax Law Offices are here to answer some of these questions for you. What is Income Tax Fraud? How Can the IRS Tell the Difference Between Negligence and Fraud? The IRS is not dumb. They all know that tax code is quite tricky, and most people simply cannot understand all the ins and outs of all the small details. When small and careless errors happen, and there are no signs of fraud, then the IRS will typically find that it’s safe to assume the taxpayer meant no harm. When this happens, they will chalk the issue up to negligence or a misunderstanding. Do not think that you’ll get off without being penalized, however; the IRS will still fine people who make these mistakes up to 20 percent of the underpayment. Who Commits Income Tax Fraud? Those who are paid mostly in cash and those taxpayers who are self-employed are usually the ones committing tax fraud the most. This is because it is easy to underreport any cash that you may be receiving. When the IRS investigates any tax code violations, they use the IRS Criminal Investigation branch of their agency. They look into tax crimes, money laundering, and other financial violations. Since our tax system here in the states is based entirely on individuals complying with the law on their own, the IRS attempts to keep everyone honest by publicizing any convictions, as well as seeking prison time for those who are guilty. Taxpayers who choose to try to wiggle their way out of paying their income taxes are going to face a few different criminal and civil punishments. Of course, the type of fraud will also determine the penalty. Trying to skip paying taxes: When someone is convicted of attempting to evade or defeat paying taxes, they are guilty of a felony. These people can be imprisoned for up to five years and face a fine up to $250,000 for individuals or $500,000 for corporations. False statements and fraud: This also leaves the taxpayer guilty of a felony that can result in up to three years in prison, as well as the fines that were previously mentioned. Willful failure to file a return or pay taxes at the time required: This leaves the taxpayer guilty of a misdemeanor, and it can result in imprisonment for one year, a fine of up to $100,000 for an individual or $200,000 for a corporation, and possibly both of these punishments. We can help you as you work through your difficulties with the IRS. The attorneys at Tax Law Offices are knowledgeable and can assist you as you seek the best possible outcome of your case. Contact us today to learn more and schedule your free consultation. We look forward to doing our absolute best when it comes to helping you.